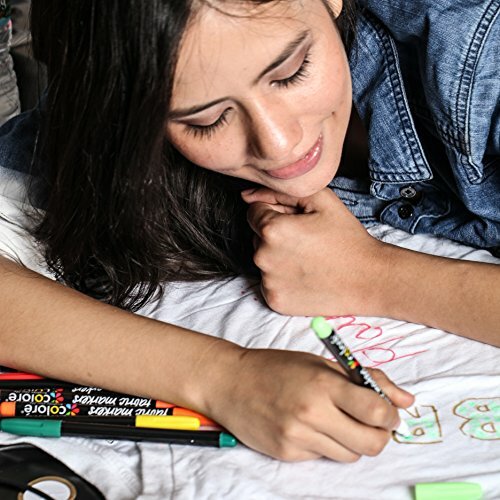 VIBRANT COLORS – These Colore Professional Grade Fabric Pen Set includes 20 richly pigmented high quality fabric markers, among the colors are black, blue, green, yellow, orange, red, pink and purple colors. PERFECT GIFTS for Art Students and Artistic Moms on Christmas, Thanksgiving, Birthday, Graduation, Valentine’s and Easter Day. Colore Fine Writers Markers are guaranteed to bring your fabric to life by adding vibrancy and color intensity. 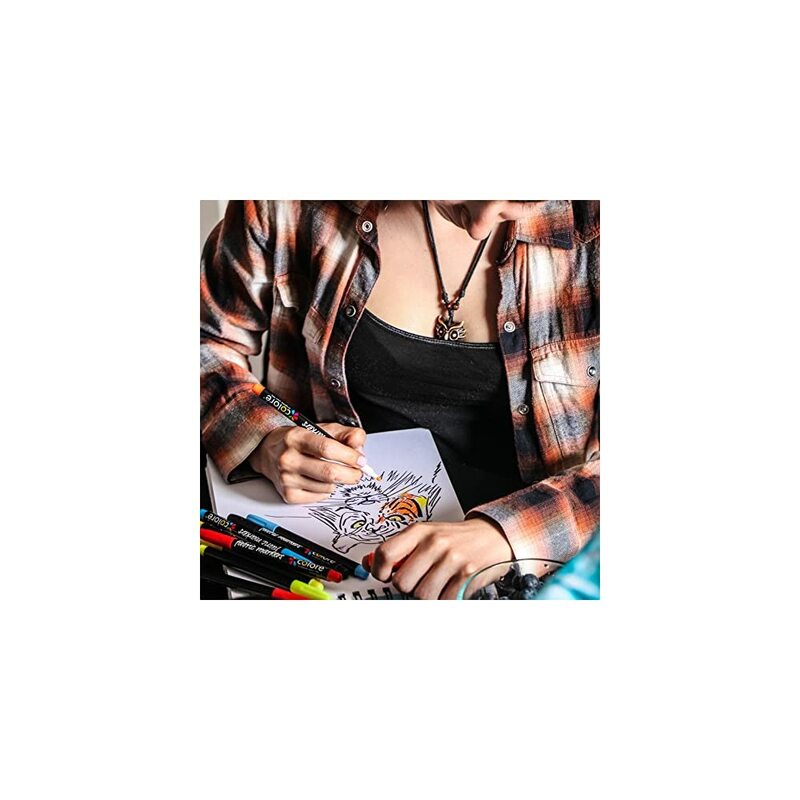 These fabric pens are great for beginners, teens or adult artists that love drawing and painting on blank canvas, light or dark colored fabric, purse, handbags, blue jeans and other fabric materials. BEST VALUE Fabric Markers Kit – The brush tip writes thick and the ink has been specially developed to produce high color pigment retention that will not fade away when washed. Expertly designed bullet tip for thick writing, easy color picking, creative decorating & pro-grade calligraphic writing. Are you looking for a high quality fabric markers set guaranteed to add more life to your art work? 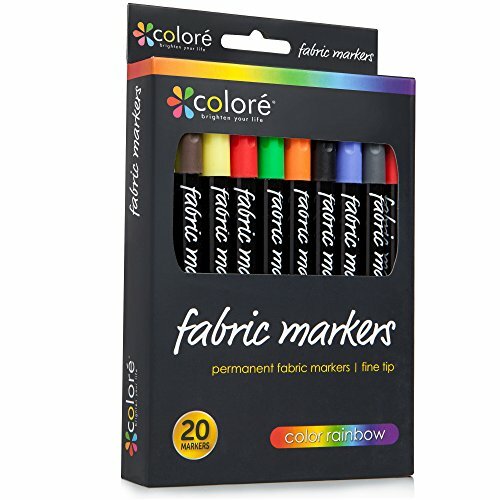 Then look no further than this Colore Premium Fabric Markers Set to see why it’s perfect for you! 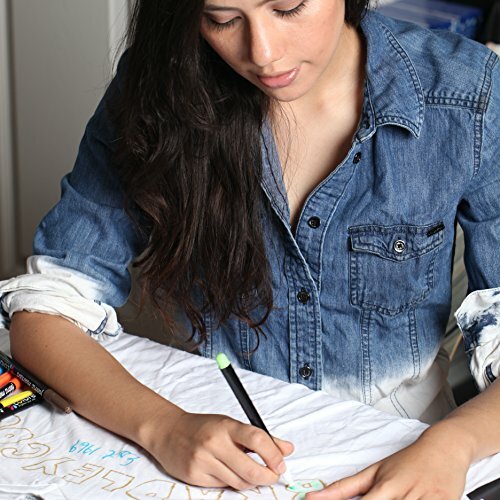 Colore Fabric Markers offer a unique and exceptionally pleasing way to create artwork on fabric! They are excellent for decorating personalized t-shirts, shoes, bags and other fabrics without having to deal with the inconveniences of using dyes. These easy to prepare and easy to set fine line fabric markers are perfect for creating wild bright designs on all types of fabrics including cotton and polyester materials. These fabric markers work great on light and dark colored fabrics! 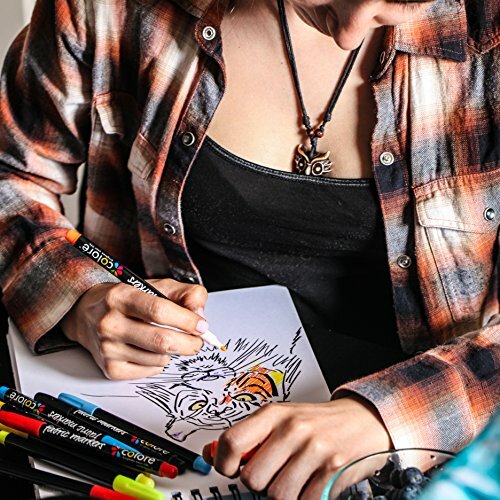 This pack contains a collection of 20 richly pigmented fine line markers designed to produce detailed drawings with colors that pop. Each marker point can be held straight to draw on thin lines and wider lines on all kinds of clothing including, jeans, shoes, T-shirts, backpacks and purses, among others. Colore Fabric Markers are durable, long lasting and fade resistant. Colore fine writers’ markers are manufactured to be extremely easy to use for a wide range of fabric painting or textile designing needs. 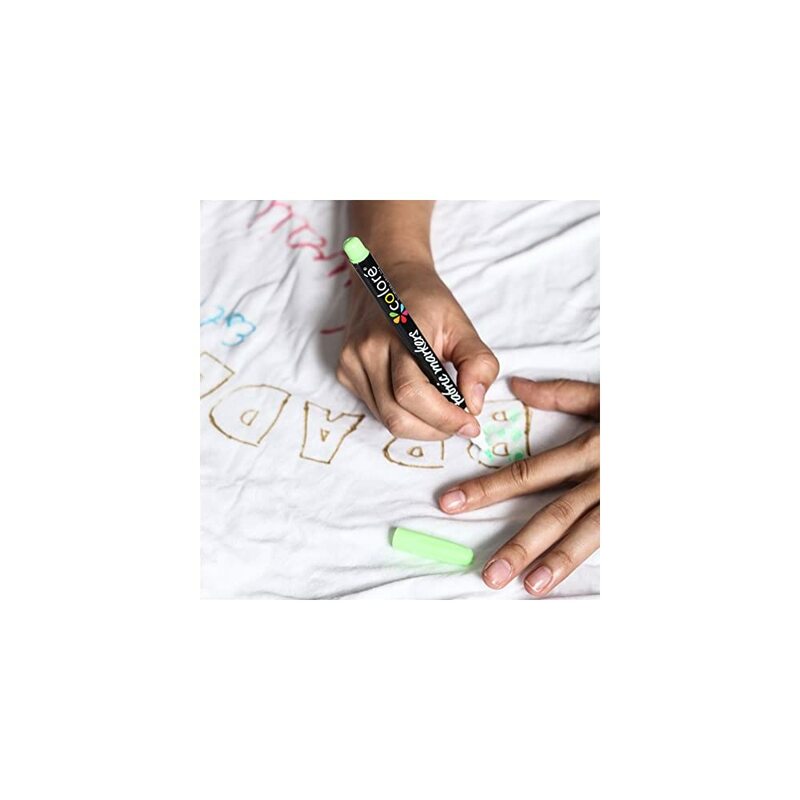 So whether you are an experienced artist or a professional painter trying to make use of different materials for your fine writing needs, our fabric markers are guaranteed to give you fantastically exceptional results on every fabric material you decide to use. With these fabric markers, you can create your own bold and brightly colored designs on any fabric of your choice. Click the ADD TO CART Button to buy now with confidence! FADE & WEATHER PROOF – Colore fine writers markers are designed and manufactured with excellent resistance to help protect your artwork from weather damage. The superb light fastness of our fabric markers will not only produce detailed drawings that pop but also ensure that your fabric designs will remain unaffected by elements of light, time and weather. SATISFACTION GUARANTEE – We are so confident that you’ll love your new fabric markers set that we’re giving you a lifetime guarantee. Get yours NOW! These would be great for getting artistic on old t-shirts, give them a new lease of life. Not so good if a small child got their hands on them and decided to doodle on their clothes as the colours do not wash out. Great value pack.